Even though this is a bit bright, I like the non-traditional color! 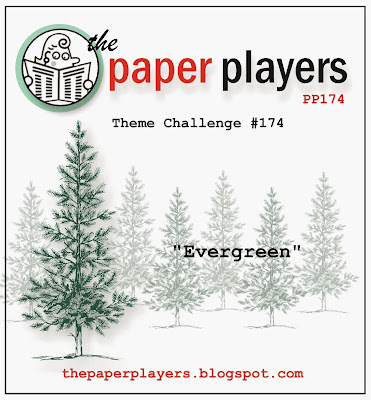 I hope you’ll play along at The Paper Players and share your evergreen creation with us as well! She didn’t eat much turkey, but she kept us all entertained! Have a blessed day! Gorgeous card! Love the burlap. I might have to play along. Love the luscious green you used on this card and the piece of burlap looks fabulous, it gives this card a nice rustic flair. The embossing folder looks like snow falling. Could you tell me where did you get it? I would love to purchase it. I've never seen one like this. Thank you for sharing. Lovely card w the CHF set. I also have that set, but you conceptualized it much differently than I have used it in the past. I think I'll get it out for inking again. Sure wish CHF was still around. I'm still trying to get my hands on the stamp set w the vintage pumpkin label. Gorgeous card, sweet friend! Love that touch of burlap behind the trees! Thanks so much for playing the Color Throwdown!! Wonderful thinking out of the box!! Love the layout and use of the colors!! Those trees on the embossed background and burlap are perfect!! Thanks for playing with us at CTD!! Your green card base is so fresh and lovely LeAnne and I adore those pines!! Beautiful card. You have giving me an idea for another card to make with my RB tree stamps. I love this lay out. Great little helper you have there! What a beautiful design...the trees look awesome and I love how you used the burlap!!! Thanks for joining us for the Color Throwdown Challenge!!!! LOVE the card, LeAnne! Glad you got to play! What fun that we used the same color challenge and sketch together, LeAnne! Yours has an entirely different feel. Love the great background, your use of the burlap ribbon, and the embossing really looks like falling snow! Thanks for a great challenge! LOVE your circle of pines with the "snow" embossing! This is so unique and a really beautiful use of the throwdown colors! Love it! 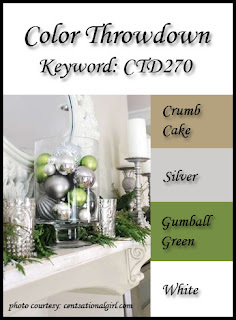 This may not be a traditional evergreen color but I love the bright pop of gumball green and the collage of festive images. The burlap is a great rustic touch! Loved this challenge!